Because of our special relationship with Klon we can get this as fast, or faster than anyone in the industry. In some cases, we even have preferred build slots we can offer you. "Sounds like I just turned my amp way up !!! I can still tell it's my guitar :) "
The Klon KTR pedal is based on the legendary Klon Centaur. 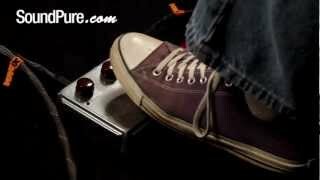 It can give you a great transparent clean boost but don't be afraid to turn the gain up and make your amp sing - you'll love it !!! 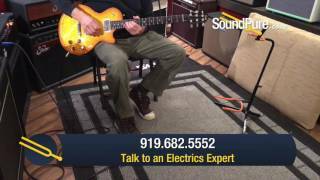 In this video, Sound Pure electric guitar specialist Eddie Berman tests out the Gibson 2017 Les Paul Standard T Honeyburst #170030933 (Used) with a Suhr 2017 Badger 18 Amp Head, a Suhr 1X12 Veteran 30 Speaker Cabinet, a Strymon El Capistan dTape Delay Effect Pedal, and a Klon KTR Overdrive Pedal. 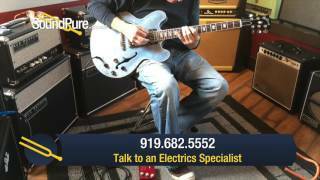 In this video, Sound Pure electric guitar specialist Eddie Berman tests out the Gibson 2015 Memphis ES-335 Indigo Blue #10095711 (Used) with a Suhr 2017 Badger 18 Amp Head, a Suhr 1X12 Veteran 30 Speaker Cabinet, a Strymon El Capistan dTape Delay Effect Pedal, and a Klon KTR Overdrive Pedal. 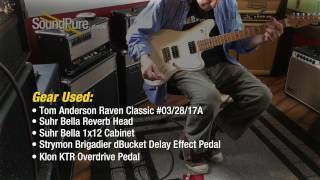 In this video, Sound Pure electric guitar specialist Eddie Berman tests out the Tom Anderson Raven Classic #03/28/17A with a Suhr Bella Reverb Head, a Suhr Bella 1x12 Cabinet, a Strymon Brigadier dBucket Delay Effect Pedal, and a Klon KTR Overdrive Pedal. 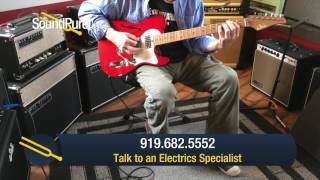 In this video, Sound Pure electric guitar specialist Eddie Berman tests out the Suhr Custom Classic T Candy Apple Red TV Jones #31387 (Used) with a Suhr 2017 Badger 18 Amp Head, a Suhr 1X12 Veteran 30 Speaker Cabinet, a Strymon Brigadier dBucket Delay Effect Pedal, and a Klon KTR Overdrive Pedal. 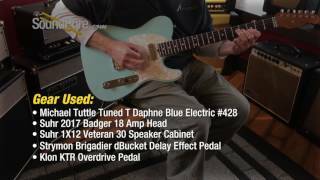 In this video, Sound Pure electric guitar specialist Eddie Berman tests out the Michael Tuttle Tuned T Daphne Blue Electric #428 with a Suhr 2017 Badger 18 Amp Head, a Suhr 1X12 Veteran 30 Speaker Cabinet, a Strymon Brigadier dBucket Delay Effect Pedal, and a Klon KTR Overdrive Pedal. 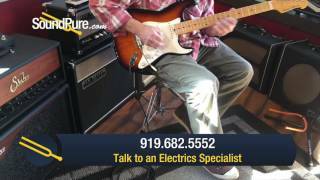 In this video, Sound Pure electric guitar specialist Eddie Berman tests out the Tyler Studio Elite HD Alien Guano Electric #16148 (Used) with a Suhr 2017 Badger 18 Amp Head, a Suhr 1X12 Veteran 30 Speaker Cabinet, a Strymon Brigadier dBucket Delay Effect Pedal, Klon KTR Overdrive Pedal. 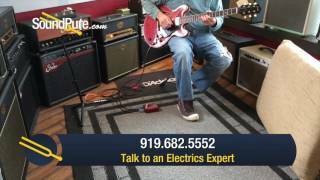 In this video, Sound Pure electric guitar specialist Eddie Berman demonstrates the Baker B3 Wood Oxblood HH Electric #186 (Used), with a Suhr 2017 Badger 18 Amp Head, a Suhr 1X12 Veteran 30 Speaker Cabinet, a Strymon Brigadier dBucket Delay Effect Pedal and a Klon KTR Overdrive Pedal. 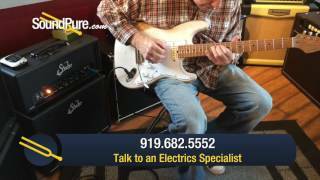 In this video, Sound Pure electric guitar specialist Eddie Berman tests out the Suhr Custom Classic Antique Trans White SSS #31328, with a Suhr 2017 Badger 18 Amp Head, a Suhr 1X12 Veteran 30 Speaker Cabinet, a Strymon Brigadier dBucket Delay Effect Pedal and a Klon KTR Overdrive Pedal. 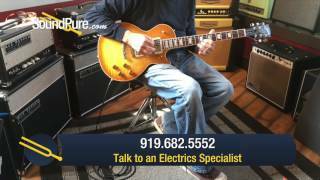 In this video, Sound Pure electric guitar specialist Eddie Berman tests out the Michael Tuttle Tuned ST Butterscotch HH Electric #363 with a 3 Monkeys Grease Monkey II Tolex Amplifier Head, a Suhr Bella 1x12 Cabinet and a Klon KTR Overdrive Pedal. 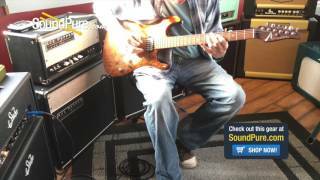 In this video, Sound Pure electric guitar specialist Eddie Berman tests out the Anderson Drop Top Honey Shaded Edge w/ Binding #01-25-16N with a Suhr 2017 Badger 18 Amp Head, a Suhr 1X12 Veteran 30 Speaker Cabinet, a Strymon Brigadier dBucket Delay Effect Pedal, and a Klon KTR Overdrive Pedal. 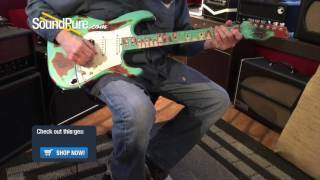 In this video, Sound Pure electric guitar specialist Eddie Berman tests out the Tuttle Custom Classic S Satin Aqua Metallic HSS #394 (Used) with a Suhr Bella Reverb Head, a Suhr Bella 1x12 Cabinet and a Klon KTR Overdrive Pedal. 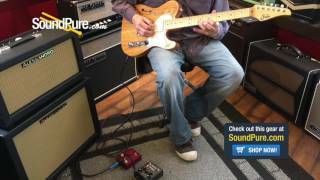 In this video, Sound Pure electric guitar specialist Eddie Berman tests out the Suhr Alt T Pro Vintage Natural HH Electric #JST4M3X (Used) with an Alessandro Crossbred Mutt Head & 1x12 Cab (Used), a Strymon El Capistan dTape Delay Effect Pedal and a Klon KTR Overdrive Pedal. 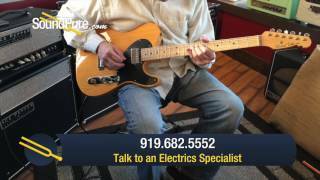 In this video, Sound Pure electric guitar specialist Eddie Berman tests out the Tyler Studio Elite HD Barn Find Finish HSS Guitar #16082 with a Suhr Bella Reverb Head, a Suhr Bella 1x12 Cabinet , a Strymon El Capistan dTape Delay Effect Pedal and a Klon KTR Overdrive Pedal. 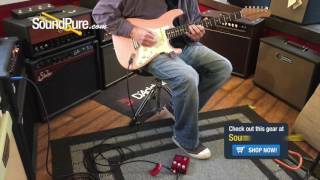 In this video, Sound Pure electric guitar specialist Eddie Berman tests out the Suhr Bella Reverb Head & Suhr Bella 1x12 Cabinet with a Strymon El Capistan dTape Delay Effect Pedal a Klon KTR Overdrive Pedal and a Suhr Classic Antique Shell Pink Electric Guitar (#31663). 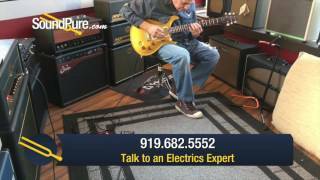 In this video, Sound Pure electric guitar expert Eddie Berman tests out the PRS DGT (David Grissom) Gold Top Electric #233293 with a Suhr SL-67 Hand Wired Amp Head, a Suhr Badger 2X12 Veteran 30 Cab, a Strymon El Capistan dTape Delay Effect Pedal, and a Klon KTR Overdrive Pedal. 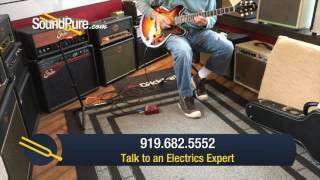 In this video Sound Pure electric guitar expert Eddie Berman tests out the Michael Tuttle Carve Top Standard 2.0 Ice Tea Electric #4 with a Suhr Bella Reverb Head, a Suhr Bella 1x12 Cabinet and a Klon KTR Overdrive Pedal. 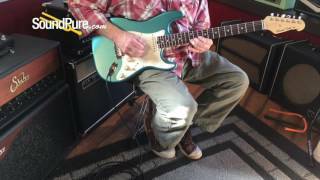 In this video Sound Pure electric guitar expert Eddie Berman tests out the Michael Tuttle Carve Top Standard 2.0 Faded Blue Electric #5 with a Suhr Bella Reverb Head, a Suhr Bella 1x12 Cabinet and a Klon KTR Overdrive Pedal. 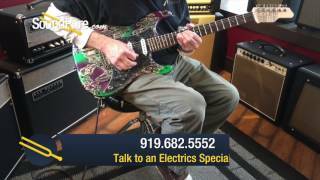 Treble Setting: Don't reflexively leave your Treble setting at noon, as a lot of players seem to do with tone controls on their pedals. The Treble control is capable of providing subtle gradations in high-frequency response and is usable and natural-sounding throughout its entire range; trust your ears, and use the control. Output Setting: To use the unit as a true overdrive - hitting whatever follows it in your signal path harder than your straight-through signal would - your Output setting will almost certainly need to be above 10:00. 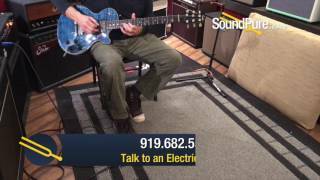 Different amps and pedals have different input-stage headroom characteristics, so take some time to experiment with the Output to find whatever setting gives you the best results with your particular setup; often settings in the 11:00 - 1:00 range work well. Clean-boost Mode: With the Gain control at its minimum setting, the unit is in clean-boost mode. In this mode the circuit has enormous headroom and will not generate any distortion of its own. Clean-boost enables you to hit the front end of your amp harder, or the next pedal in your signal path harder, without changing any of the essential characteristics of the signal the unit received - instant same-pickups-but-hotter capability. Slide Switch: The output of the unit's predecessor, the Centaur Professional Overdrive, was buffered, an effective solution to the problem of signal degradation due to cable capacitance. This unit, informally named the KTR, allows the user - via the switch - to choose between buffered output or so-called true-bypass output the former almost always yields a signal with more presence than the latter. Outboard Power: Most regulated 9-volt power supplies should work fine. Do not attempt to power the unit with more than 9 volts, as damage to the circuitry will result, necessitating the replacement of the entire circuit board; please note that this kind of damage is not covered under the unit's warranty. Battery Power: As it did in the original Centaur, the standard Duracell Coppertop works well and sounds good in the KTR as well, so use that particular battery if possible. 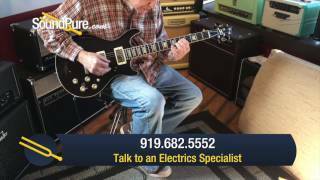 Expect about ten hours' life from a new Duracell; replace the battery whenever you hear a loss of dynamic range, a high-pitched tone (the symptom of a very weak battery), or anything else out of the ordinary. Velcro: Standard inch-wide Velcro along the very top and bottom edges of the unit's die-cast bottom will neither hide nor harm the screen printing. Warranty: Three years, parts and labor, to the original purchaser with no evidence of abuse or attempted modification; please keep your sales record.